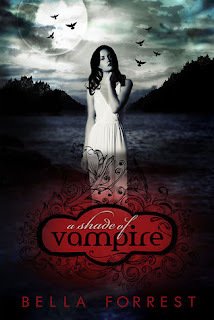 Contrary to my pathetic excuse that I've had enough of vampire books already, I still read A Shade of Vampire with hopes that it will be at least good and different. And to my surprise, I liked A Shade of Vampire more than I thought I would. Bella Forrest's interpretation of the vampire race is fresh and quite different from the others I've read or seen. And her words provided a vivid picture of what her vampire world would look like. The Shade, for instance, is one of the unique elements of the story that makes A Shade of Vampire stand out a little from the rest. Instead of living and blending in with humans, vampires here (or at least vampires under the Novaks) are closed off and separated from the real world, though they may occasionally come out of their sanctuary. Plus, I have not noticed that they have the ability to compel humans to do their bidding, which is a common thing for vampire stories nowadays. But the "drink my blood so your wounds would heal" is there, which kind of reminds me of The Vampire Diaries. In terms of the flow of the story, it is fast paced, thus making it a bit short for some peoples' liking. It wasted no time with extremely lengthy descriptions or those filler scenes. The good thing about this is that readers will always be interested and they are less likely to be bored, which it successfully accomplished. The negative side, though, is that it did not delve into great details about each character's life. It went straight to Sofia's abduction, with very little to no family background. Ben wasn't even put into the spotlight properly, which he should have because he's a significant part of Sofia's life before The Shade. Readers would have developed a greater attachment with both of them if more life story was told. Even the vampire's stories were vague - no origin of how they came to be, or how you turn a human into a vampire. The characters are diverse, but they have not been given much of a chance to get noticed a lot due to the fact that the focus is mostly on Sofia and Derek. Derek, in particular, has been introduced greatly. He is a prince known by many as dark and compulsive, which was also supported by the synopsis of the book. I must say that that synopsis was deceiving. Derek Novak is... (just read it to find out). Sofia, on the other hand, is just okay. She is not really one of the greatest female characters out there, but she's nice. Now to the more intriguing part of the story... Sofia and Derek's relationship. I was actually a bit confused about both of their intentions/emotions at first. But eventually, I got it and the development of their friendship became clearer. As the story goes on, Derek Novak became more admirable, despite his flaws, because of the things he would do for Sofia, and their relationship became better. In totality, the book was great, but another concern of mine would be the length of the book. Not just the shortness of the story, but the abrupt ending without even having fully resolved the conflict. Even knowing that there is a second book, I still feel like I stopped reading in the middle of a good book. It's not the typical cliff hanger feeling. But all in all, I did enjoy A Shade of Vampire. Though, I'm still not sure if a little less than a complete four out of five stars would represent how I feel towards the book, I'd give it anyway.